Summary: Globally Champagne at auction is a small but growing sector, with New York leading the way. THE GLOBAL auction market in Champagne may be small, representing less than 2% of the entire auction market worldwide, but it is considered important among collectors, consumers and producers. Note 1This article was based on auction sales of Champagne at Sotheby’s (NY, HK and London), Acker Merrall & Condit (NY, HK), Zachys (HK, NY), Hart Davis Hart (Chicago) and Christie’s (HK, NY, London) between 1 January 2006 and 31 July, 2011 – a total of more than 6,300 auction lots. The records are based on unmixed, non-verticals. The bulk of all Champagne sold at auction is vintage Champagne, although NV appears from time to time, as shown in Table 1 Note 2In some tables lot values are reduced to their 75cl standard format and prices recalculated accordingly, eg if a magnum 1.5l lot sells for £500, the 75cl equivalent is £250. It is worth noting that there are significant premiums attached to larger formats which tend to skew the results where this calculation has been used depending on the underlying sales data., which is an analysis of the vintages and their frequency. These vintages tend to correlate with the better years – the top 10 in Table 1 are all very good to excellent vintages for Champagne. There is also a column on this chart to reflect the results for Dom Pérignon, the most traded label at auction. 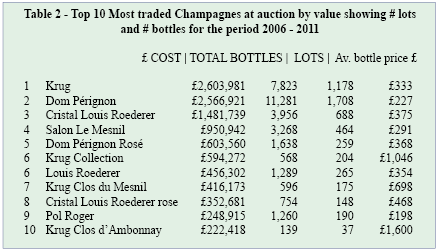 In terms of volume (number of bottles/lots sold), the most traded wines are Dom Pérignon followed closely by Krug – see Table 2. If one looks at the value of the wines sold at auction then the picture painted is somewhat different. Moreover, the amount of Krug sold (all labels amount to some £3.35million+) Note 3All prices include buyers’ premiums. is more than twice that of third placed Louis Roederer (vintage and Cristal) and is almost 20 times that of the Champagne house 10th on the list. This may reveal more about quantities than qualities. However, the presence of Salon at position number four is all the more remarkable given the small quantities of the wine produced. The UK has always been considered the heart of the Champagne trade outside of France. It is, after all, France’s largest export partner. However, auction sales worldwide (Chart 2) paint a very different picture. Note 4Average prices (where stated) are obtained using a proprietary weighting by quantity sold. This evolution has been mainly driven by the New York firm of auctioneers Acker Merrall & Condit and to a lesser extent Zachys. 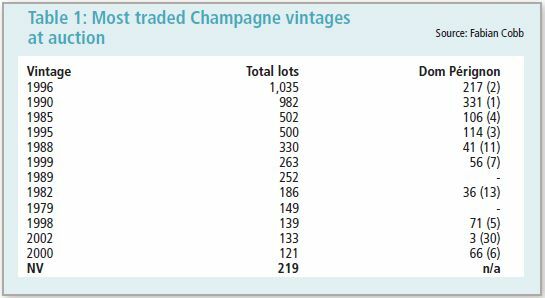 What this table shows is just how Champagne sales at auction have grown over the years. 2011 looks set to be at least as good as 2010. Clearly, there is a shifting of focus pushed by the Far East who've come from nowhere in 2007 to occupying the number two slot in 2011 and this has affected auction sales in both Chicago (Chicago has become a notable hub for sales to the Far East) and London. The poor showing of London is undoubtedly due to the availability of Champagnes in the UK through other channels, also simply the lack of Champagne coming onto the secondary market (it’s mostly drunk) and a disinclination by UK auction houses to list a product which may seem a lot more work to sell compared to mature Bordeaux. Paradoxically, when Champagne is sold in the UK it is conservatively estimated by the auction houses whereas, in fact, historically London has not been a particularly cheap place to buy Champagne, as Table 3 shows. The average value of a bottle (75cl format only) of Do m Pérignon 1990 has also risen continually throughout the period: 2006 – £131, 2007 – £1129, 2008 – £128, 2009 – £152, 2010 – £172and 2011 (to July) – £192. Bibendum in September 2011 offered this wine for £1,100 (x6 75cl IB). In March 2011 Christie’s sold cases for £897 incl BP (the auction season has yet to get under way as the time of writing), so it’s worth shopping around. Obviously some wines, partly because of their short supply and partly because of their reputation, obtain higher values than others. Table five shows a list of these for various vintages. In June 2011, Acker Merrall & Condit obtained a world auction record for a bottle of Champagne, selling a bottle of "shipwrecked" Veuve Clicquot for $43,630 (HK$339,615). The sale took place in Mariehamn, Aland, where the Champagne was salvaged in 2010 from a 19th century shipwreck off the Aland Islands in the Baltic Sea. The previous record was set in 2008 when bottles of 1959 Dom Pérignon sold for $42,350 each. In May 2010 a vertical of Dom Pérignon Rosé Oenothèque, a world première release from their reserve cellar, achieved HK$1,331,000/US$170,554 and was the first HK$1 million lot of wine Sotheby’s sold in Hong Kong. In March, 2009 Acker, Merrall & Condit HK sold one bottle (75cl) Krug Collection 1928 for HK$164,560 (a world record for a singlebottle lot of Champagne). 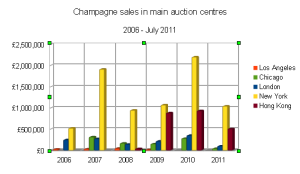 It seems certain that the volume of Champagne sold at auction will increase considerably in the years ahead. While the opportunity for buying particular wines or vintages is something of a lottery there are enough stocks of the most traded wines to satisfy the largest group of buyers who may be looking for stock, while some apparent rarities don’t always do so well. It is no coincidence that the largest number of sales are transacted in the last quarter of the year, towards the festive season. It might also provide producers with a good outlet for selling at a higher margin. For consumers and collectors, auctions offer an occasion full of the anticipation, excitement and atmosphere which complements the occasion for which the wine may be destined. The chances are that Champagne purchased at auction will also have the requisite bottle ageing almost impossible to guarantee under any normal circumstances other than cellaring the wine oneself. It is worth noting that there are significant premiums attached to larger formats. ...you need to subscribe to be able to view topical content from Fine Wine magazine. Subscribe HERE to Fine Wine to read content as it becomes available. Log yourself in if you are already a member and you will be returned to this page. 1. ↑ This article was based on auction sales of Champagne at Sotheby’s (NY, HK and London), Acker Merrall & Condit (NY, HK), Zachys (HK, NY), Hart Davis Hart (Chicago) and Christie’s (HK, NY, London) between 1 January 2006 and 31 July, 2011 – a total of more than 6,300 auction lots. The records are based on unmixed, non-verticals. 2. ↑ In some tables lot values are reduced to their 75cl standard format and prices recalculated accordingly, eg if a magnum 1.5l lot sells for £500, the 75cl equivalent is £250. It is worth noting that there are significant premiums attached to larger formats which tend to skew the results where this calculation has been used depending on the underlying sales data. 3. ↑ All prices include buyers’ premiums. 4. ↑ Average prices (where stated) are obtained using a proprietary weighting by quantity sold.